Baptized 27 September 1925 in St Anne's Church, Hindsford, Atherton, Lancashire. To Richard and Sarah Jane Lofthouse, living at 80 Willows Lane in Daubhill by H.G. Prescott Fathers occupation: Carter. notes According to Passenger Lists, Nathaniel Lofthouse was one of numerous professional footballers (The FA Tourists of Canada) leaving the port of Liverpool on 9 May 1950, bound for Montr�al, Qu�bec on board the Empress of Scotland. They returned to Liverpool on 30 June, on board the Empress of Canada. His address is stated as 42 Temple Road in Helliwell, Bolton. Married to Alma Foster, on 6 December 1947 [registered in Bolton, December 1947]. Lofthouse married in the morning, and scored twice for Bolton Wanderers in the afternoon, against Wolverhampton Wanderers FC. Died 15 January 2011, aged 85 years 142 days, in a nursing home, Bolton, Lancashire. Club(s) A local Bolton lad, he played schoolboy football, also Lomax's FC and Bolton Boys Federation FC, when he was signed as a 14 year-old by Bolton Wanderers FC manager Charles Foweraker. He played football during wartime while working as a "Bevin Boy" coal miner, and became professional in 1946. But on the day he put pen to the paper, on 4 September 1939, he watched in bemusement as the whole Bolton team boarded military transport to join the war which had been declared the previous day. Lofthouse was given £10 as his signing-on fee. Despite handing in a transfer request in January 1947, with Tottenham Hotspur FC reportedly seeking his signature, and again in September 1950. In April 1954, Italian side, Fiorentina AC offered Lofthouse �2000 per year to sign for them. His club rejected the offer. Lofthouse scored 255 goals in 452 league appearances, being prodigious with both feet and a brilliant header of the ball. An ankle injury forced retirement on 6 January 1960. Individual honours Football League (fifteen appearances, 24 goals). Distinctions Appeared on ITV's This Is Your Life 7 April 1993; Freeman of Bolton 2 December 1989. Appointed an Order of the British Empire 1 January 1994. Bolton Wanderers FC brand new stadium, the Reebok Stadium, named their East Stand after Lofthouse 18 January 1997. Inducted into the Hall of Fame 2002. Club(s) Following his retirement, Lofthouse became a trainer for the reserve team from 10 July 1961. He stepped up to chief coach in June 1967. The ultimate position of manager came in a caretaker capacity in August 1968, followed by full-time on 18 December 1968. He was promoted to general manager in November 1970, and became a chief scout for the club from August 1971 to June 1972. His one-man-club came to an end when he became the Lancashire scout for Arsenal FC from September 1973. Took over as Bolton Wanderers FC manager briefly again in December 1985. Player number 702nd player to appear for England. First match No. 261, 22 November 1950, England 2 Yugoslavia 2, a friendly match at Arsenal Stadium, Highbury, London, aged 25 years 87 days. Last match No. 328, 26 November 1958, England 2 Wales 2, a British Championship match at Empire Stadium, Wembley, London, aged 33 years 91 days. Distinctions First player to score twelve braces for England. Only equalled by Bobby Charlton. First player to score twice as an England substitute. Leading England goalscorers for four seasons. 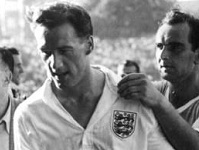 Record England scorer from May 1956 until October 1958, then with his final goal, was equal record goalscorer alongside Tom Finney, until October 1963. Became life-President of Bolton Wanderers FC in 1986, and even until April 2003, worked commercially with the club he served with distinction for so long. - An English Football Internationalists' Who's Who. Douglas Lamming (1990). Hatton Press, p.159/60. England's selectors announced their forty-man party from whom the final 22 would be selected, on April 22 1958. Of the 18 players who were cut from the party on 28 May, they included Nat Lofthouse.